23850 Via Italia Cir #906, Estero, FL.| MLS# 219027568 | Bonita Springs, Estero, Naples, Fort Myers Beach FL Real Estate | Marie Pimm PA Realtor. Representing U.S. and International Buyers and Sellers in the purchase and sale of investment or personal property. Marie is a skilled 1031 Exchange Realtor. C.16110 - Contemporary wall finishes you must see. 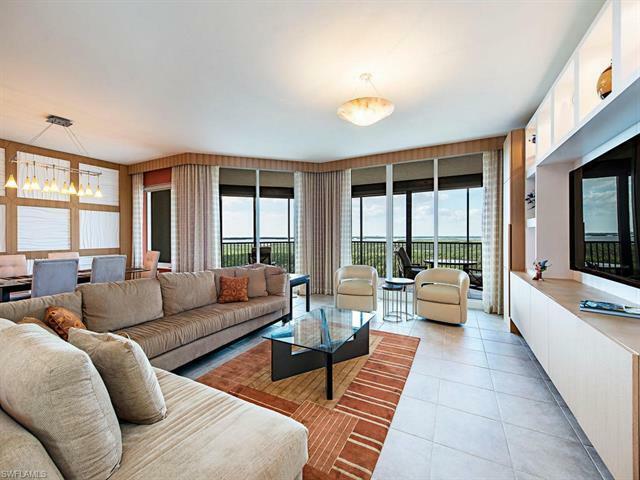 NINTH floor corner Florencia residence offering magnificent panoramic sunrise and sunset views of Estero Bay and Gulf of Mexico. Private elevator entrance. Three bedrooms and a den every room has a view. Tile throughout except the bedrooms. Automatic shutters. 2 spaces in the garage. An exceptional price for this exceptional home. Come experience for yourself why high-rise living is so popular. Take a tour of the amenities, all pristine and new, the fitness facility, the theatre and the"South Beach" style pool area with cabanas. Florencia has it's own fitness, movie theatre, beautiful resort pool, 2 guest suites, and privacy officer to greet you and your guests.Living at The Colony, residents enjoy a host of activities and amenities. You are cordially invited to join in the fun! Amenities including a private beach park, private waterfront dining at The Bay Club, huge tennis program, canoe/kayak parks, sailing, pickleball, lots of classes.